This is one of our excellent machines we used this glorious weekend for serving up a storm in Liverpool, they really loved our company just as much as our meat. There is nothing we love more than happy customers who enjoy our events. It is open top based to catch people’s eyes as they walk past or to even get those who are waiting a mouthwatering start even before the meat has touched their lips. If we are promoting our business cooking in a town centre we would want people to instantly be drawn into our canopy by the juicy hog and this machine complements it wonderfully because it’s open topped you can see the meat slowly get browner and look more appetising while you sit waiting for the chef to serve the meat. Whilst the hog sits in the tray it’s juices will slowly coat the underneath making it even more juicier than before. These juices can also be used to slowly cook other meats such as chicken, turkey, pork, beef and lamb. It can even cook other foods to complement the meat such as jacket potatoes, roast potatoes, vegetables or you can use the juices to make wonderful hog gravy which tastes truly divine. 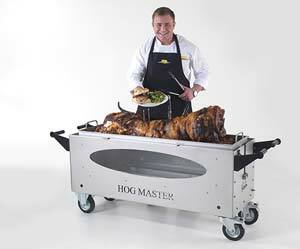 We have made this hog roasting machine easy to transport and move around. Simply push or pull the machine when finished with it wherever you want it to go. It’s wonderful for us due to the fact we can load it up and push it out within seconds and no time is wasted setting up or leaving for another venue. There are safety handles to help you push and pull the machine too which also comes in handy. There are many accessories to complement our hog roasting machine to turn it into something different such as spit roasting kit where you put the hog on the spit and roast the hog. BBQ ones where you transform the hog roasting machine into a BBQ for them BBQ lovers, there are even a chicken spit to cook up to 30 chickens at one time. With all these kits you can roast any meat you desire, the possibilities are endless. 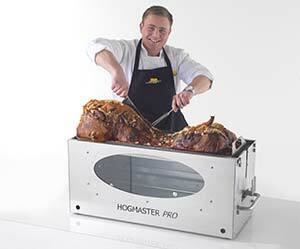 Whoever you cook for, whether it’s a family event, wedding, private party or any kind of party, make sure you amaze everyone and become everyone’s favourite chef with a Hog Master Machine. The Hogmaster Being Appreciated For It’s Fantastic Qualities!